Lets start at the beginning – the 2011 floods. I started feeling a bit run down and thought it was anaemia, turns out it was Ross River and Glandular Fever… at the same time! Since then I’ve suffered from chronic pain and Fibromyalgia. In 2014 I had a headache for over a month, I saw GPs, emergency doctors, head specialists and took more pain killers than any one person should have to. It took one doctor to think outside of the usual ‘you have anxiety’, put all of my symptoms together with the points related to Fibromyalgia and give me an actual diagnosis. The usual treatments like medications and physio don’t work for me. I get rebound headaches from the drugs and physio is insanely painful. Enter Acupuncture. Natural, drug free, minimal pain and used for more than 2000 years in the eastern world. 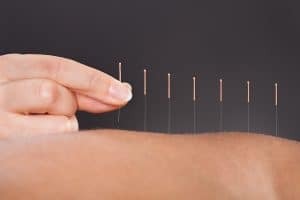 Much research has been done using mixed treatments of modern and traditional medicine, and while no one can say 100%, acupuncture has been found to aide in hundreds of physical and psychological conditions. From www.acupuncture.org.au – ‘The origins of acupuncture can be traced back over 2,000 years, making it one of the oldest health care systems in the world. Today, acupuncture supports the treatment of a wide number of conditions. The practitioner may also stimulate the acupuncture points using other methods, including acupressure, moxibustion, cupping, laser therapy, electro-stimulation and massage, in order to re-balance the flow of qi. assists in the prevention against disease and the maintenance of general well-being’. I am no expert, all I can do is share my experience. My first session was amazing. I walked in feeling horrible. Tension headaches, exhaustion, anxiety. I walked out feeling light, relaxed, calm. TMI– I have horrible digestion and my gut health is terrible, I found that I was able to go to the bathroom and my bloating went away for a few days after my treatment. My tension headaches went away, my sleep improved and I had more energy. After a few days the benefits went away, acupuncture is something you need to do regularly, just the same as any other treatment. Thanks to Bookwell, a booking site for all of your beauty and wellness needs, I was able to find an amazing acupuncturist, Julie Constantine of Turning Point Acupuncture. Julie has an Advanced Diploma of Traditional Chinese Medicine, Advanced Diploma of Applied Science and Certificate in Acupuncture Point Injection Therapy. Julie has 18+ years experience. On first meeting her, I could see how passionate she is about what she does. She explained how it worked, went through my history with me and asked what I would like to get out of my treatment. I will admit I was a little confused at first by the different body functions as TCM is very different to modern medicine, but once I looked into everything she had said, it all made perfect sense. I feel that she really understood what areas needed healing. As an anxious person, some of the feelings when the needles are in makes me nervous but Julie explains what points she is working with as well as what I may feel and the TCM reasons behind it. If you suffer from chronic illness, mental health issues, or even stress, I recommend looking into the benefits of acupuncture. Again, I cannot say that This treatment will help, but sometimes we have to try different things to find what works for our individual needs. Head over to www.turningpointacupuncture.com.au for more on Julie Constantine, what she does and how it could help you, as well as contact information.